This page begins with a listing of the children killed on May 30 1943 in the parish church of St. Marychurch, Torquay. But the raiders who came that day created other incidents close by. Further down the page, after the listing of the children who died, there is another casualty list which includes adults who were also in the church as well as those who were killed elsewhere in St.Marychurch. "This photo appears in the Vol 2 of The Pictorial Survey of Babbacombe and St Marychurch, compiled by my late brother-in-law Leslie Pateman and published 1991 by the Babbacombe and St Marychurch Traders' and Hoteliers' Association. It appears on page 216 and is a photocopy of the newspaper page published in the Torquay Times June 4 1943. As this was wartime, the newspaper did not identify the actual place viz: St Marychurch and records only that the photo is "All that is left of the chancel of a Westcountry parish church when FW190s swept in from the sea to drop their bombs. Children attending a Rogation Sunday service were the chief victims of this, the most pathetic incident of the raid. I well remember those "hit and run" raids that we had for some considerable time all along that coast until the Allied forces took Cherbourg and the Normandy peninsula. My husband especially remembered that day in 1943 when St Marychurch was bombed as his family were evacuated into an hotel for several days as their house had been damaged at that time. Those raids were made more scary by the fact that the air raid sirens did not sound until the German planes had come and gone! " Different sources quote different numbers of casualties but below is the number killed as carved in stone over the doorway of the rebuilt church. This states that 26 children and teachers were killed in the church itself. Sadly, we have so far traced only 21 children and 3 adults so our search must continue. This event occurred 63 years ago and the dead commemorated here were children - they left no descendents to mourn them and the girls who came from the Erskine Home in Babbacombe would have been in that place because they had already lost one or both of their parents. Perhaps someone still visits the graves of those children who are not buried here. Adults who died in the same raid are listed on this page below the names of the children. Civilian. Charles Henry Collings of 18 Princess Street, Babbacombe. Son of John and Ann Collings, of Boston Fields and husband of Emma Louisa Collings (née Cribbett) (see also William Henry Cribbett in the TORQUAY victims list). Born in the December Quarter of 1868 in Torquay. Died 30 May 1943 at 18 Princess Street aged 75. Gladys Hilda Beale aged 12, of 10, The Downs, Babbacombe. Daughter of the late Seaman Beale. Phoebe Lousia Cook aged 12, of 10, The Downs, Babbacombe. Daughter of Ralph Cook of 120 Leesland Rd., Gosport, Hants. Margaret Cook aged 11, of 10, The Downs, Babbacombe. Irene Davies aged 9, of 10, The Downs, Babbacombe. Daughter of Frank Davies of 137 Riverside Mansions, Shadwell, London. Joyce Sylvia Gifford aged 11, of 10, The Downs, Babbacombe. Daughter of Driver Perch Henry Ralph Gifford of the Royal Army Service Corps. Eileen Florence hare aged 10 of 10, the Downs, Babbacombe. Daughter of the late Arthur James Hare. Joan Margaret Loveday aged 13, of 10, The Downs, Babbacombe. Daughter of Harold Nelson Loveday of 33, Ivybridge Way, Stonebridge, London. Kathleen McDonald aged 11, of 10, The Downs, Babbacombe. Daughter of the late Patrick McDonald. Gerald Babbage aged 9 of 16, Park Rd., St. Marychurch. Son of Cyril and A. Babbage. (Harold) Peter Barber aged 9 of 200, Teignmouth Road. Son of Sgt. Harold Barber of the Royal Army Service Corps and Elizabeth Grace Barber. Aubrey Harold Brown aged 10 of 18 Haytor Rd.,Westhill, St. Marychurch. Son of Mr. and Mrs. Harold Arthur Brown. Edward Charles William Burn aged 10 of33, East Pafford Avenue, Watcombe. Son of William Henry and Dorothy Eva Burn. Sylvia Mary Daniel aged 9 of 36 Park Rd., St. Marychurch. Daughter of L. A. C. William Richard Daniel of the RAF and D. E. Daniel. Kenneth Norman Hellier aged 12 of 11 Daison Crescent, Westhill, St. Marychurch. Son of Herbert Harry and Beatrice Mabel Hellier. Donald Thomas John Hext aged 10 of 19, Daison Crescent, Westhill, St. Marychurch. Son of Thomas and Frances Hext. George Horace Lavers aged 13, of 13, Empire Rd., Westhill. Son of James Wheeler Lavers and Florence Edith Mabel Lavers. Injured at the church; died the same day at Torbay Emergency Hospital. Mary Lilian Perrottt aged 12 of 25 First Avenue, Westhill. Daughter of Frank Burt Perrott and Lilian S. Perrott and twin sister of Michael (see below). Betty Edwina Rees aged 13 of "Bellner", Shirburn Rd. Daughter of Thomas Edwin Rees. Pauline Cynthia Ryder aged 12 of 14, St. Margaret's Avenue, Westhill. Daughter of Samuel and Edith Ryder. Injured at the church; died the same day at Torbay Emergency Hospital. We have since learnt that Pauline attended Torquay Grammar School for Girls. At the time of her death, she was in Form IIIA. Valerie Grace Taylor aged 14 of 5, Third Avenue, Daison. Daughter of George and Lucy Taylor. The destruction of the parish church and the people inside it was not the only incident in St. Marychurch on 30 May 1943. The large detached houses in Petitor Rd. were targeted and two people unlucky enough to be caught out in the open at Babbacombe were machine-gunned and killed. 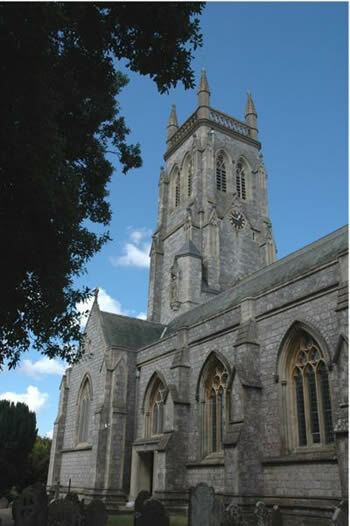 As the raiders turned to leave, one of the enemy aircraft clipped the spire of the nearby Roman Catholic church, immediately losing height and crashing into houses in Teignmouth Rd., killing the pilot and injuring at least one other person who later died. During the same raid, there were casualties in the vicinity of Torquay sea front; these are included in the separate Torquay casualty list. Charles Henry Collings of 18 Princess St., Babbacombe. The son of the late John and Ann Collings of Boston Fields and husband of Emma Louisa Collings. A Londoner, he was previously a photographer. Died at 18 Princess Street 30 May 1943 aged 75. Clifford Reginald R. Cooksley of 11 Princess St., Babbacombe. He was the son of Mr. and Mrs. C. H. Cooksley and was born in the March Quarter of 1927 in Torquay. He had volunteered to be an ARP Messenger and died at 22 Princess Street aged 16. William Henry Cribbett of 8 Silver St., Ipplepen, Nr. Newton Abbot. He was the son of Cpl. William Henry Cribbett of the RAF and Olive Mary Cribbett and was born in the December Quarter of 1928. He died at Princess Street aged 14. Edith Kathleen Elson of 294 Teignmouth Rd., St. Marychurch. She was the daughter of Mr. and Mrs. Frederick Cyril Elson of 12, Millais Rd, Bush Hill Park, Enfield, Middlesex. She was injured in the raid of 30 May 1943 and died 5 June 1943 at Torbay Hospital aged 18. She lost her life while warning others to take cover. Edith Rebecca Fox of "Westroyd", Ketley Bank, Oakengates, Salop. Daughter of the late Edward and Bertha Fox. She died at "Courtfields", Petitor Rd., St. Marychurch 30 May 1943 aged 58. Marshall Gabbett-Mulhallen of "Ashton Lodge", Petitor Rd., St. Marychurch. Husband of Martha Gabbett-Mulhallen of St. Mary's. Teigngrace, Newton Abbot. He died at "Ashton Lodge" 30 May 1943 aged 80. Alice Gertrude Jamieson of the Women's Land Army. She was the daughter of Horace and Mabelle Jamieson of 37, Alleyn Park, Southall, Middlesex. She was injured while walking on Babbacombe Downs on 30 May 1943 and died the same day at Torbay Emergency Hospital aged 26. Herbert Stewart Marshall of "Courtfield", Petitor Rd., St. Marychurch. He was the son of Thomas and Emily Marshall of The Larches, Wigan, Lancs and the husband of Marie Marshall (see below) and had been a colliery owner in the north of England. He died at "Courtfield" 30 May 1943 aged 77. Letitia Marshall of "Courtfield", Petitor Rd., St. Marychurch. She was the daughter of Herbert Marshall (see above) and Marie Marshall (see below).She died at "Courtfield" 30 May 1943 aged 41. Marie Marshall of "Courtfield", Petitor Rd., St. Marychurch. She was the daughter of Mr. and Mrs. Cotton, the wife of Herbert Marshall (see above) who she married in 1899, and the mother of Letitia (see above). She died at "Courtfield" 30 May 1943 aged 70. Theresa Ann Scanes of 25 Cary Park Rd., Babbacombe. Daughter of the late Alfred and Lucy Scanes formerly of St. Marychurch and widow of William Scanes. Injured on Babbacombe Downs 30 May 1943 and died the same day at Torbay Emergency Hospital aged 67. Violet Victoria Blanche Scott of "Shrublands", St. Margaret's Rd., St. Marychurch. Also known as Ottewell. Born in Greenwich in 1880. She was a member of the WVS and is believed to have been a Sunday School teacher. She died at the church 30 May 1943 aged 62. Audrey Daisy Sharkey of 90, Hartop Rd., St. Marychurch. Daughter of Mr. and Mrs. Rowe and wife of LAC Jack Sharkey of the RAF, Injured at Babbacombe 30 May 1943 and died the same day at Torbay Hospital aged 21. Elsie Sheppard of 10 Orgreave Lane, Handsworth, Sheffield. Believed to be a Church Army Sister who had accompanied the eight girls to church from the Erskine Home. Died at the church with the children 30 May 1943 aged 30. Ruby Muriel Treeby of 23 Third Avenue, Daison Heights, St. Marychurch. Daughter of John and Mary Treeby. (John Treeby was a Corporation Rate collector for Torquay). Ruby is believed to be the other Sunday School teacher in the church that day. She died there 30 May 1943 aged 56.